Nestled in the countryside of Benedict’s Bavaria is a Benedictine monastery that was founded in 994, grew in renown for its magnificent illuminated manuscripts, and was visited by such luminaries as Wolfgang Amadeus Mozart. The Seeon Monastery flourished until 1806 when governments in the wake of Napoleon’s revolution expropriated all Church buildings and lands throughout Europe. Now beautifully restored, it serves as a cultural center where the visual arts, music, enlightening lectures, and the restored art of calligraphy abound. Seeon will serve as our base for exploring the picturesque and culturally rich area where Pope Benedict was born, raised, educated, and formed. The facilities are clean and modern and the food outstanding. From here we will visit the village where Joseph Ratzinger was born, Marktl am Inn; the town where he went to school, Traunstein; and the church where he celebrated his first mass, Sankt Oswald. Next we will visit Pope Benedict'‘s favorite Marian shrine, Altötting, sometimes referred to as the “Lourdes of Germany.” We will take a cable car to hike in the Bavarian Alps he loved so dearly and enjoy a spectacular view of meticulously kept farms and of the one of the largest lakes in Germany, Chiemsee. There will also be boat rides on the lake to visit the women’s Benedictine monastery on the “Dame’s Isle” which has been a place of prayer and praise since 740, predating even Charlemagne who is sometimes referred to as the founder of Europe. Another boat ride will take us to the “Men’s Isle,” where there had been a men’s monastery, so that we can visit the magnificent castle built by King Ludwig as a replica of Versailles. We will leave Seeon and settle into the town of the fortified cathedral in Freising where Father Ratzinger studied and later taught theology. Finally, we will spend the day in Munich where Ratzinger was the Cardinal Archbishop before being called to Rome to serve as the Prefect of the Congregation for the Doctrine of the Faith. 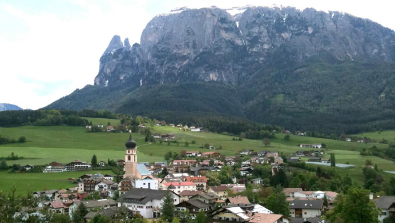 One of the most spectacularly beautiful spots in the Alps is the South Tyrol in northern Italy. Part of Austria until after the First World War, German is still the common language. It was a favorite vacation spot for Pope John Paul II and is now for Pope Benedict. A week will be spent at the Sport Hotel Sonne on the Seiser Alm, the highest meadow in the Alps spread before majestic snow-covered peaks. The region is renowned for its magnificent woodcarving and religious art. Its village chapels are some of the most beautiful in all of Europe with their painted walls and spectacular carved statuary. The faith of these mountain people is vibrant and colorful. Activities will include hiking mountain trails; taking gondola rides into St. Ulrich (Ortisei), one of the most fashionable shopping areas in the Alps; riding in horse-drawn wagons; and dining nightly on formal four-course gourmet dinners. The hotel features incomparable Alpine views, a swimming pool, sauna, and steam room. Lectures will also be offered on the history of the region and Pope Benedict’s views on liturgy and worship.